Natural ambient light: pre-dawn glow. 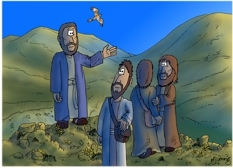 Jesus is gesturing up towards the mountain, their final destination. Jesus often went out alone, or with a few of his disciples to pray & commune with God the Father. Simon/Peter, James & John appear to have been particularly close disciples of Jesus. 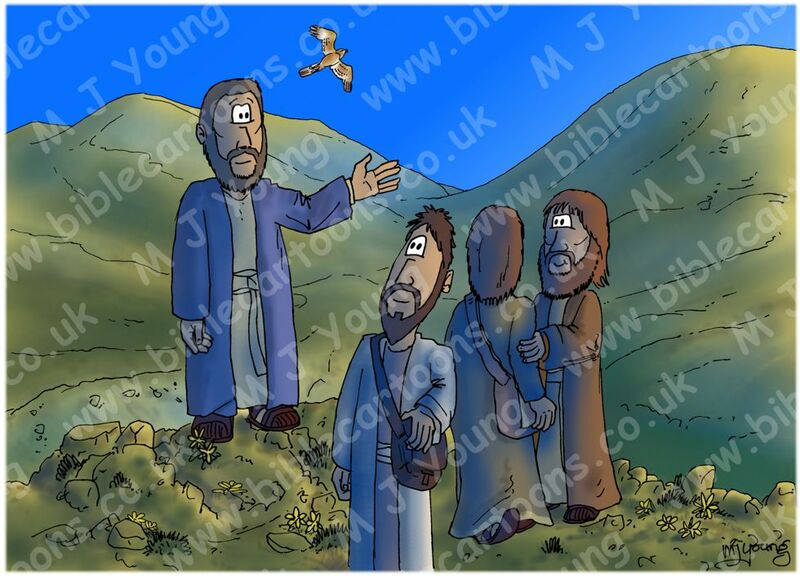 Which mountain Jesus & His 3 disciples went up is uncertain. Some believe it may have been Mount Tabor (west of the Sea of Galilee) others believe it may have been Mount Hermon (noth west of the Sea of Galilee.) I have elected to situate my cartoons on the latter. Tragopogon buphthalmoides (the yellow flower) is a common perennial herb on Mt Hermon. Google earth position & orientation – 33 deg 25’ 48.51” N 35 deg 55’ 28.02” E Looking NW. The summit of mt. Hermon is on the left, out of sight of the viewer. Israel is also on the left, beyond these mountains. Damascus, in Syria, is off to the right & behind the viewer, approx. 23 miles away.